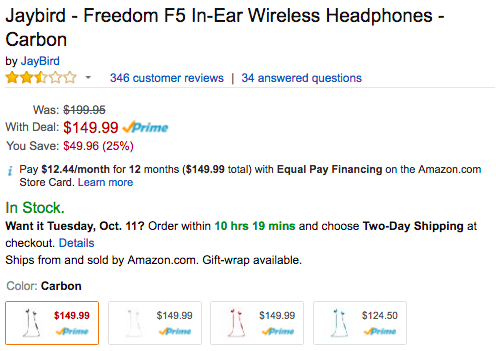 Amazon offers the Jaybird Freedom F5 Wireless Bluetooth Headphones in three colors for $149.99 shipped. Also at Best Buy and Target. Today’s deal is $50 off the regular price, a match of our previous mention and the lowest that Amazon has ever sold them for. The Jaybird Freedom headphones are a perfect companion for iPhone 7 with a lightweight design and Bluetooth connectivity. In our in-depth review, we noted its Apple-friendly looks and impressive sound. A sweat-resistant and slim design is accented by a metal exterior in your choice of three colors. There is a built-in remote that includes Siri control, volume and playback buttons. Jaybird includes multiple eartips made of memory foam and silicone with your purchase. Over 350 Best Buy customers have left a 3.9/5 star rating. You’ll note that Amazon’s rating are more mixed, but we’ve recommended this pair as one of our top wireless picks. Micro-sized, sweat-proof premium metal buds delivering superior audio performance (music & calls) rivaling the best in wired headphones. Enjoy 8 hours of play time with on-the-go listen-while-you-charge mobile charging (4 Hrs on-board + 4 Hrs with the included Charging Clip). Customize your sound settings and save them to your buds with the Jaybird MySound app. Patented secure-fit for ultra comfort, ready for anything you can dish out on the trail, on the streets, in the gym or on the slopes.